The Tube was packed. An animated man, oblivious to those around him, whacked my forehead with a British flag plastered with the Queen’s face. I smiled. I love how much some Britons adore their Queen, and their fondness for the royal family was in full stride this week. I was visiting England for five days, and my trip had unintentionally and providentially coincided with Queen Elizabeth’s Diamond Jubilee. I knew I had to get back to my sketchy hostel before dark, but I just wasn’t quite ready. I wanted to walk around the city a bit more, but hadn’t picked a place to go. The passengers around me began moving toward the door as we approached the St. James’s Park station, so I decided that this stop was as good as any. As soon as I stepped onto the platform, I was swept along by a river of people all flowing in the same direction. I mentally shrugged my shoulders and walked along, curious as to our destination. Before I knew it, I was right outside Buckingham Palace where hoards of people were cheering in front of a giant screen broadcasting the Diamond Jubilee Concert, which featured stars from Jessie J to Sir Elton John. Once again I was amazed. I had stumbled across a totally unexpected and completely rewarding experience. Each trip I have taken on my own has been filled to the brim with little gifts consisting of people I’ve been able to meet and places I’ve been able to experience. I hadn’t traveled alone prior to my semester abroad in Spain, but it became necessary in order to complete research for my thesis. I enjoyed it right from the start; while I love traveling with my friends, I cherished those weekends when I could just hop on a bus and explore a city on my own. As cliché as it may sound, these adventures helped me learn more about myself than any group trip could have. By getting lost, missing buses, and setting my own itinerary just to see it thrown into disarray, I discovered how I responded to new and potentially stressful situations when there’s not much of a safety net. I couldn’t rely on anyone else to take the lead or make decisions, and I found that I really excelled in these situations. I hadn’t expected that of myself. Traveling alone also had more practical benefits. I tended to meet more new people than when I traveled with friends. When I traveled alone, I could go where I wanted to go and spend more time in the places that aligned with my interests. I also found myself traveling with a more defined purpose rather than aimless wandering or quick sightseeing. I would eventually like to pursue a career in the museum field, so I was ecstatic as I entered the British Museum. Everything about the museum is geared to amaze, from the architecture to the lighting to the emphasis placed on the more sensational pieces such as the Rosetta Stone. I spent hours in the museum, taking note of which exhibits incorporated new, interactive methods of engaging the visitor and which conformed to the traditional mausoleum model defined by innumerable objects and limited educational content. It was absolutely incredible to stand in front of the Elgin Marbles, the collection of stone objects acquired by Lord Elgin when he was ambassador to the Ottoman court in Istanbul in the early 19th century. These were objects I had only dreamed of seeing, let alone have the time to analyze them within the context of all I had learned in my Museum Studies minor at CC. I doubt I would have been able to do that had I been with a group. Solitary travel definitely has its drawbacks and requires a great deal of practicality and common sense, but I think that everyone should take at least one trip alone, whether it’s 10 miles away or 10,000. It is wonderful to wander, but I have personally found it more rewarding to curb some of that aimlessness by intentionally choosing destinations that can teach me something new about the things that I’m interested in. Travel with friends, travel with family, but also take time to travel alone because you may surprise yourself. 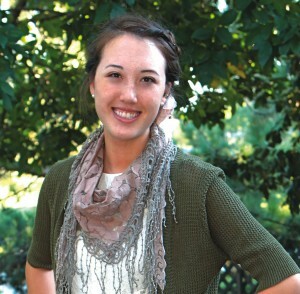 Kristi Tani ’13 majored in anthropology at CC and plans to volunteer in Ireland and Morocco with a Christian humanitarian organization for the next five months. Upon returning to Colorado, she hopes to work with AmeriCorps for a year or two before applying for graduate programs, most likely in anthropology or museum studies/museum education. 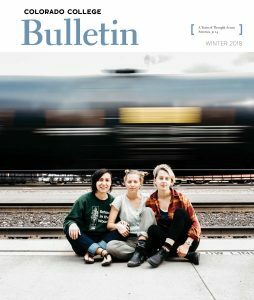 Submit a potential “First Person” essay of 600 words or less at bulletin@coloradocollege.edu.